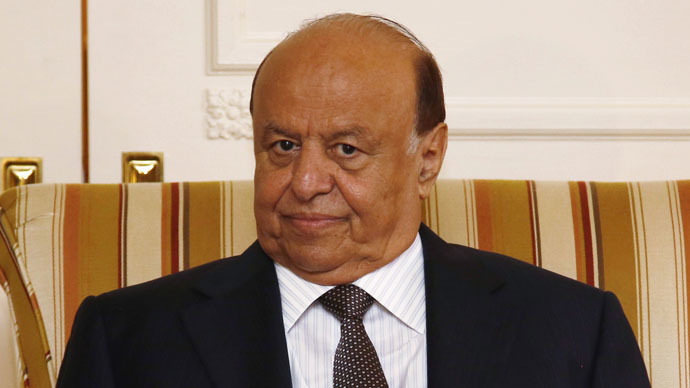 Yemeni President Abd-Rabbu Mansour Hadi has submitted his resignation amid a standoff with Houthi rebels that has seen him surrounded in his own residence, Reuters reports citing a government source. Baha was apparently referring to a stand-off between the president and the Houthis – a powerful Shia movement whose gunmen are in position outside his residence. Senior Houthi official has welcomed the president’s resignation. However the Yemeni parliament is rejecting Hadi’s resignation, according to Saudi-owned news channel Al Arabiya. Hadi has been at loggerheads with the Shia Muslim movement since it overran the capital, took over security and started dictating terms to his administration. A source quoted by Reuters said that Hadi’s resignation letter had cited the failure to achieve a peaceful transfer of power as one of the main reasons for his departure. “We have found that we are no longer able to achieve the objective for which we had endured so much suffering, desertion and lack of participation from partners in the political process in shouldering the responsibility to help Yemen (reach) safety," read the letter. Earlier on Thursday the Houthis welcomed the concessions proposed by the government regarding power-sharing. On Wednesday, the rebels had agreed to withdraw their fighters from the presidential palace as well as freeing former nominee prime minister and the presidential office manager, Ahmed bin Mubarak. Gulf states denounced the seizure of the presidential palace by the Houthis on Wednesday as a coup d’etat. The Yemeni government was composed mainly of technocrats and politicians from a range of political parties and won a parliamentary vote of approval. However, Houthi leaders have accused Hadi of attempting to bypass a power-sharing deal signed in September and have insisted that they are trying to protect the state from corruption.